I am a hypocrite. I enjoy eating meat, even though I know about the way it is ‘produced’ (a sterile, technical term, to disguise the suffering and killing of animals, which have been bred under horrendous conditions, drugged, and tortured before they end up on my plate), even though I know about the disastrous impact that our current irresponsible level of meat consumption has on the environment, climate, and world hunger. I am a hypocrite. I show few signs of distress over the living and dying conditions of animals that are bred for consumption in my own culture. I treat them as if they are no living beings, but things, man-made, without a soul, without a life that is worth preserving. But woe betide anyone who mistreats cute, adorable animals – dogs, cats, birds, fluffy woodland creatures…! 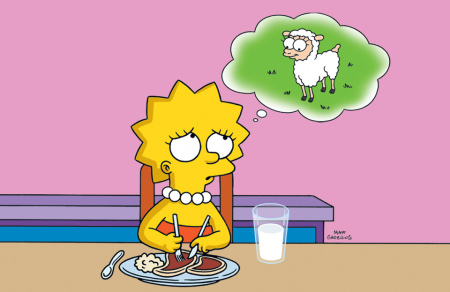 Screenshot from The Simpsons (‘Lisa the Vegetarian’). These days, I feel agitated by the news about the imminent Yulin Dog Meat Festival (listed under ‘tourism’ on Wikipedia! ), which has attracted significant coverage in the media and (perfectly well deserved) outrage in social media, amplified by the involvement of TV celebrities (among others). I know that what I see is horrible and wrong and must be stopped. But do I have a right to complain, being such a hypocrite myself? Shouldn’t I put my own house in order first? Would there be a similar outrage, if the cruel execution of animals just went on behind closed doors, like it does for the animals that I eat myself, virtually every day? I am at a loss, and even turning to the ancient Romans, as I often do, does not give me much joy: they too celebrated the public wounding and killing of animals for spectacle, entertainment, and pleasure. Issa is more playful than the sparrow of Catullus. Issa is more pure than the kiss of a dove. Issa is more loving than any maiden. Issa is dearer than Indian gems. The little dog Issa is the pet of Publius. If she complains, you will think she speaks. She feels both the sorrow and the gladness of her master. She lies reclined upon his neck, and sleeps, so that not a respiration is heard from her. And, however pressed, she has never sullied the coverlet with a single spot; but rouses her master with a gentle touch of her foot, and begs to be set down from the bed and relieved. Such modesty resides in this chaste little animal; she knows not the pleasures of love; nor do we find a mate worthy of so tender a damsel. That her last hour may not carry her off wholly, Publius has her limned in a picture, in which you will see an Issa so like, that not even herself is so like herself. In a word, place Issa and the picture side by side, and you will imagine either both real, or both painted. Not everything is terrible everywhere all the time! 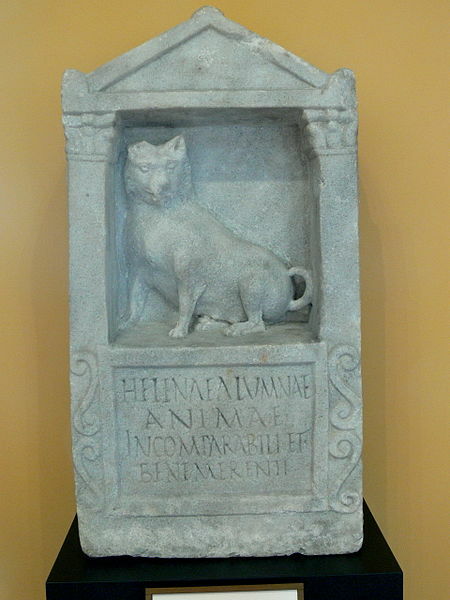 Inscription for Helena (CIL VI 19190) with dog relief (but probably not for a dog called Helena). – Image source here. 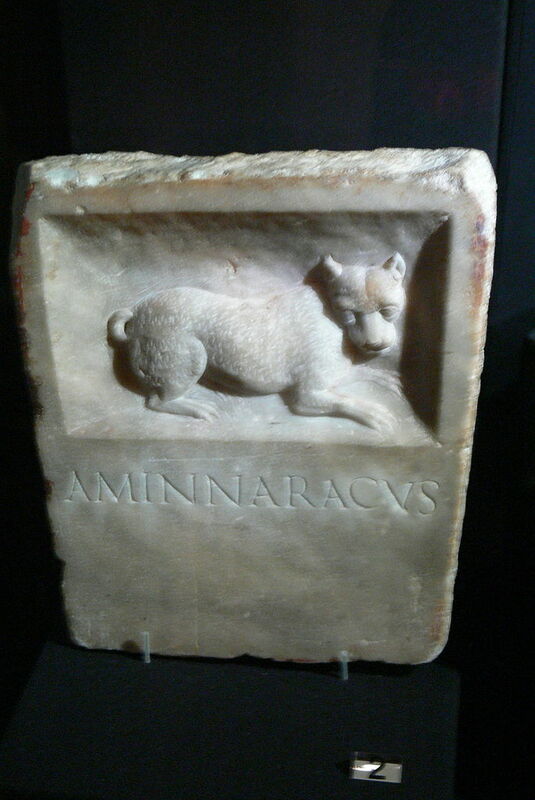 Inscription for Aminnaracus. – Image source here. 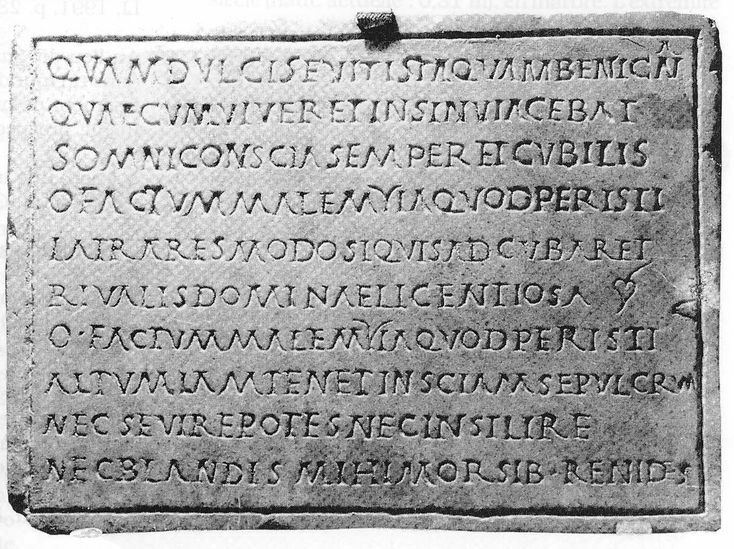 Inscription for Heuresis. – Image source here. Inscription for Aeolis. – Image source here. 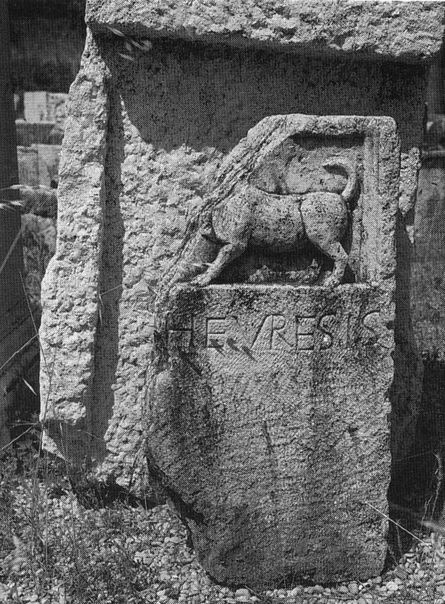 Behold the tomb of Aeolis, the cheerful little dog, whose loss to fleeting fate pained me beyond measure. corpus et eiusdem dulcia mella tegunt. nomine Fuscus erat, ter senos apstulit annos. membraque vix poterat iam sua ferre senex. In this place lies a little dog after an accomplished life, and sweet honey covers his body [sc. to preserve it?]. His name was Fuscus, and he was eighteen years old. Barely could he move his limbs in his old age . . . This guard of the coaches never barked unsuitably. Now he is silent and his shade protects his ashes. Inscription for Myia. – Image source here. nec blandis mihi morsib(us) renides. How sweet and friendly she was! While she was alive she used to lie in the lap, always sharing sleep and bed. What a shame, Midge, that you have died! You would only bark if some rival took the liberty of lying up against your mistress. What a shame, Midge, that you have died! The depths of the grave now hold you and you know nothing about it. You cannot go wild nor jump on me, and you do not bare your teeth at me with bites that do not hurt. quod feci lustris laetior ante tribus. nec poteris collo grata cubare meo. perdidimus quales, hei mihi, delicias. Bedewed with tears I have carried you, our little dog, as in happier circumstances I did fifteen years ago. So now, Patrice, you will no longer give me a thousand kisses, nor will you be able to lie affectionately round my neck. You were a good dog, and in sorrow I have placed you in a marble tomb, and I have united you forever to myself when I die. You readily matched a human with your clever ways; alas, what a pet we have lost! You, sweet Patrice, were in the habit of joining us at table and fawningly asking for food in our lap, you were accustomed to lick with your gready tongue the cup which my hands often held for you and regularly to welcome your tired master with wagging tail . . . . . . 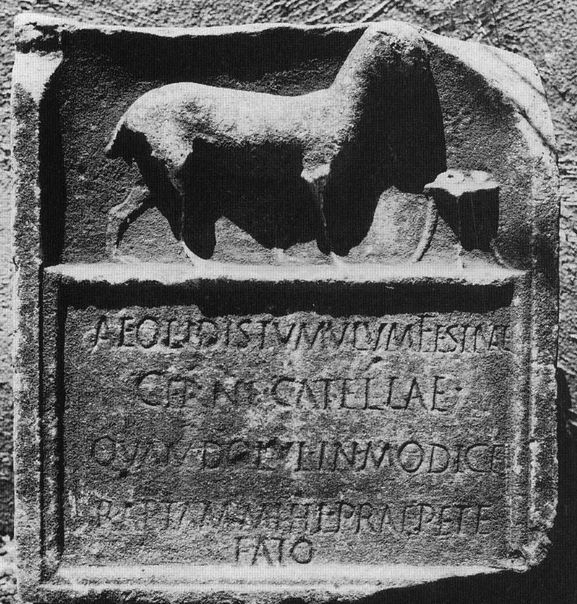 This entry was posted in Carmina Epigraphica, Epigraphy, Poetry, Prose and tagged Animal cruelty, Animal welfare, Animals in antiquity, Big questions, Carmina Latina Epigraphica, Death, Dogs, Latin Inscriptions, Meat, Yulin Dog Meat Festival. Bookmark the permalink. Ei Gott! (vel Götter!) — your apostrophic self-definition: Berliner: yes. Classicist — for my money, one of the best — you actually have ideas about the past that make sense not only then, but now (this is infinitely rarer than it should be — but that’s only one man’s opinion); scatterbrain? well: you might be convincing me with this one. Not really…but: there is that in modern (particularly European, thinks this American; particularly academic, thinks this non-academic; particularly left-leaning, thinks this man of the right) society which prefers to stare at its own navel, think itself bad and/or futile and impotent, and basically shrug — but talk, and talk, and talk. You eat meat, and like it: GOOD (so do I); SOME of that meat is in fact produced — and that is, indeed, the correct word — under hideous conditions. Yet you go on doing it. OK. Some folks DON’T eat meat, sometimes on moral grounds — I’m not one of them; but I have the greatest respect for their choice and the reasons behind it. Now, if you choose to go on eating meat, I really, truly urge you to consider whether the problem in which you find yourself is not hypocrisy but an insufficient connection to reality — a condition endemic to modern Western society: in this case — you like to eat dead things, but you have no_real_idea how they got that way….and the further your experience of killing and preparing dead things for the table gets from eating them there, the more extreme the cognitive dissonance when you do so, or occasionally confront the fact someone — somehow, no matter how well — did. It goes without saying: folks in the ancient world didn’t have this problem: death, of every sort, was omnipresent….the kind you were inflicting yourself (rather than having inflicted on you) was infinitely to be preferred — especially if the proceeds kept you alive for another day and tasted good to boot. Prescription? — says this fellow (who, along with his wife — both of us children of hunting households who did not begin hunting ourselves until our mid-40s): Take up hunting, and get a personal sense of where meat comes from, start to finish. It is a tremendously grounding experience. Particularly because we hunt over our dog, when hunting one enters the animal world as an animal, doing what animals do….and definitely as a junior partner to the dog. My wife and I eat everything we kill; I have rarely picked up a bird that fell to my gun without a tear in my eye; and it is never eaten without a prayer to the God Who — as I believe — made both it and me, that we might be made good stewards of this remarkable Creation. At the end of the hunt there are few things better than curling up in front of the fire with the dog — and the wife — and letting the dog lick the KYLIX clean. Don’t think I’m kidding, either…. Many thanks, as always, coivinix, for your comments – most thoughtful and most thought-provoking (and delightfully non-dogmatic)! I agree with what you say – that disconnect really is a problem, allowing the truth behind our foodstuffs to become invisible. I hope it’s (reasonably) clear that I’m not in the business of indoctrination or trying to convert people to become vegetarian/vegan – to each their own, and in good measure. Thanks again for your comments – I really appreciate your taking the time to write your thoughts, which I thoroughly enjoy! The issue of insulation from the real is — well, the REAL problem…in so many ways. This is an issue the ancient world, and most of history, would have (accurately, for most of it) filed under “luxury,” not “problem;” but when you’ve got to the point we have…you’ve got to move it to where it belongs, I think. For the average person in the West these days, there’s not much left in their day-to-day-experience that is, in fact, natural: rural electrification has allowed just about everybody to have day or night whenever they want it (with everything that comes along with that); temperatures can be controlled to just what you want, when you want it, almost all the time, almost everywhere; food is provided, prepared in ready-to-cook condition; clothes are available, ready to wear; babies are born without pain; people die similarly — and both those events happen somewhere away from where people live, almost always; when an illness turns up that causes “perfectly healthy 20 year olds” to die, and there’s nothing that can be done for them — most recently with the AIDS virus in the 1980s — otherwise intelligent and well-read humans actually write that it is an unparalleled experience in human history — revealing that their knowledge of the actual natural state of humanity, and all of human history up to about 50 years prior to that moment, is nil. And that’s just a start. These vast misconceptions about essential truths bear fruit in choices: personal, and — put all those persons together — societal. The shell of human ingenuity which allows them to exist is immensely fragile….much more fragile than the network of roads and military forces, naval and land, which allowed Rome to win and govern much of its known world. Once it was no longer possible for a merchant in Asia to bet he’d see his money again, with interest, by shipping his goods off to Brittannia….it all came crashing down very quickly. Only a few hundred years later, one of your ancestors was standing in Bath staring at what was left and thinking “Frost Giants must have built this! ;” and it would be yet another few hundred years before the next person was able to take a sh-te in a warm room in Brittania. Our pretty little world is hooked together with a few dozen sattelites and a lot of electronics….There may be good reason to learn a bit more about the way the world really works — for all sorts of reasons. Thank you very much for your very interesting studies! Thank you so much – I’m glad you find them interesting! For the first time I’ve found such a lot of interesting and often poetic epigraphic texts about animals in Ancient World! Thank you really!